Shower and tub drains present their own challenges. The clog culprit is usually hair and soap buildup in the trap and drainpipe. When you're taking a shower you should never see standing water in the stall or tub. Properly functioning drains should carry the water away almost instantly. If water covers the shower floor and your feet, you have a clogged shower drain, which will eventually become completely blocked. A service technician skilled in shower repair techniques will use one Pieper’s Inc. tub and shower drain cleaning machines to cleanse the drain of any and all debris, restoring it to new condition. 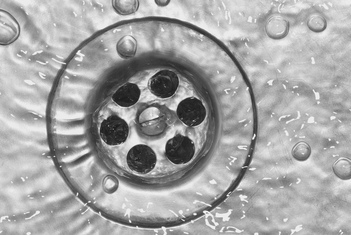 Bathroom sink drains may become clogged with hair, toothpaste, soap and grime. Pieper’s Inc. provides many bathroom plumbing solutions and sink drains are one of the more common problems we solve. Pieper’s Inc. will remove the clog and thoroughly clean the entire pipe so your sinks will drain like new. Toilet drains are sometimes overwhelmed with toilet paper and even the occasional kid's toy. Pieper’s Inc. can solve the problem with a Pieper’s Inc. machine that feeds a spinning cable into the toilet drain. The cable has special spring loaded blades on the tip that will cut through any obstruction while hugging the inside wall of the pipe and thoroughly cleaning it to restore full drainage and powerful flushes. See the toilet section for more information on toilet repair. Floor drains are common in basements, laundry rooms and garages. They may also be found on patios and driveways as well as older bathrooms. These drains are equipped with a trap that should be kept filled with water to prevent odors and sewer gas from escaping. Test drains occasionally to make sure they are aren't clogged and are ready to carry away water and prevent flooding. Dirt and debris can clog floor drains but Pieper’s Inc. can open them quickly to restore good drainage. If the main sewer line clogs, toilets and drains throughout your house will begin to backup. This is usually a very stressful situation for homeowners and it can happen at any time of the day or night. That's why Pieper’s Inc. is your 24 hour plumbing company. A technician using a machine that will cut through the clog and clean the main sewer pipe right down to its inner walls. If the technician has any indication there is a problem with the main sewer line, he may perform a video camera inspection to determine if the pipe is damaged or corroded. The technician will share the video with the homeowner and present options for sewer line repair or replacement if necessary.